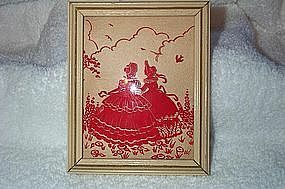 This silhouette (red on clear) is in very good to excellent condition. It measures 4 5/8" x 5 6/8". The color of the frame and back paper is cream. There is minute wear on the paint of the frame. Shipping and handling will be $8 within the USA. Please email for shipping outside the states.